We visited this park on March 15, 2015, and stayed for 9 day(s). 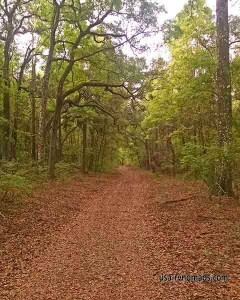 If you like rustic style camping with full hookups in a beautiful, rural area, definitely make time to visit Otter Springs Park & Campground in Trenton, FL. We had a 50 AMP, sewer and water site with a great view, although when we had neighbors they were far too close for comfort. Most of the sites are quite close together. There’s marginal TV reception via antennae, though we didn’t get any at all. For me, that was a plus, but not so much for Jerry. We did have a strong Verizon cellular and data signal, so this was a perfect place to get some work done. Much of the park is under a canopy of old Live Oaks, although not all of the campsites are shaded. Parking pads and roads throughout the park are dirt and sand. 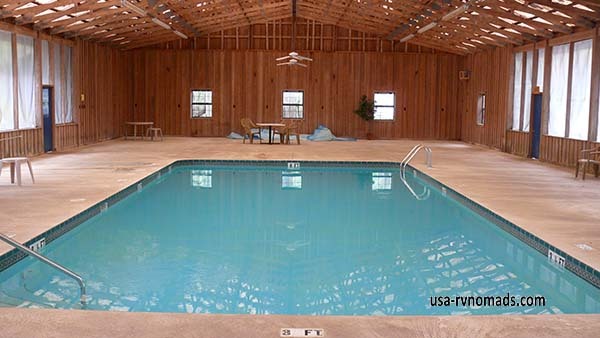 There’s a nice pool in an open building that gets its window openings enclosed in plastic through the colder months. There’s a makeshift laundry: two washers and two dryers under an overhang behind the shower houses. Normally Otter Spring feeds the nearby Suwannee River, but before our visit due to heavy rain further upstream, the Suwannee had swelled past its banks and had flooded the Spring. The water receded some each day, and finally, just before we left, we could see the rock walls bordering the Spring through crystal clear water. Crazy fish jumped feet into the air every time we visited the Spring, and an abundance of minnows of every size and tiny little polliwogs clustered near the water’s edge. This flooding also impacted most of the nature trails during our visit, making them impassable until just before we left. In spite of this, we managed to take several long walks around the property, sometimes getting our feet wet. We were serenaded by tree frogs every evening, heard owls and coyotes deep into the night, saw a couple of hawks and a small herd of deer, and heard that a Florida Panther had been spotted recently. In addition to the on-site trails, the park is in close proximity to a paved Florida Nature Coast State Trail, other natural springs, and the Andrews Wildlife Management Area. Chiefland and Trenton are only a short drive and we were able to purchase groceries at Winn-Dixie and supplies at Walmart. The park is big rig friendly, but you must be diligent to plan how you’re going to get to your site and depart. The park staff are not necessarily educated on big rig dynamics and sent us in with directions that didn’t work at all. We wound up driving through a couple rows of campsites to get into ours. Had they sent us in from the other direction, we could have backed in without difficulty. Even so, if the sites around us had been occupied at our departure, it would have been difficult to get back out due to the close proximity of several large trees. It’s worth a walk-through before driving to your assigned site. We paid about $21 per night with a military/veterans discount. 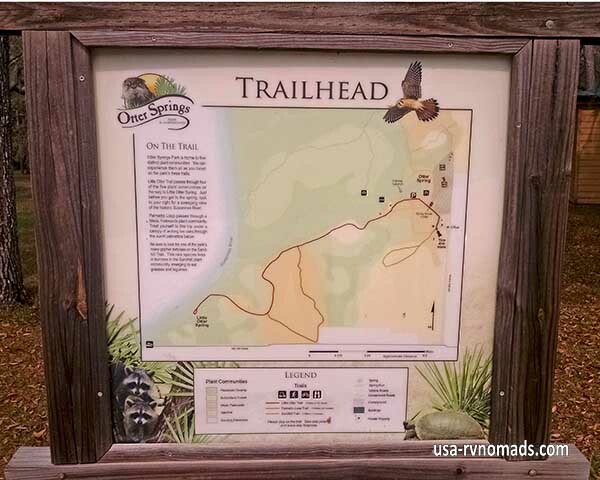 For more information visit the Otter Springs & Campground website. A 31.7 mile hiking and biking path built over old railroad tracks. Near Otter Springs, the path crosses over the Suwannee River on an old train trestle. Enjoy lunch at the Suwannee Rose Cafe, shop for antiques an crafts, and take a quilting class. You'll also find artisan crafts and stained glass workshops at the Suwannee Valley Custom Framing and Stained Glass Works. The largest hardwood hammock along the Lower Suwannee River, with over 3,000 acres of forest. 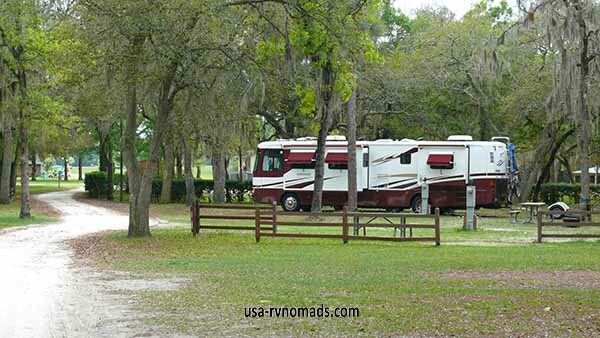 Don't expect well-groomed trails and paved roads - and don't take your RV. This is a primitive area with picnic, hiking and biking opportunities, as well as an exceptional birding venue.